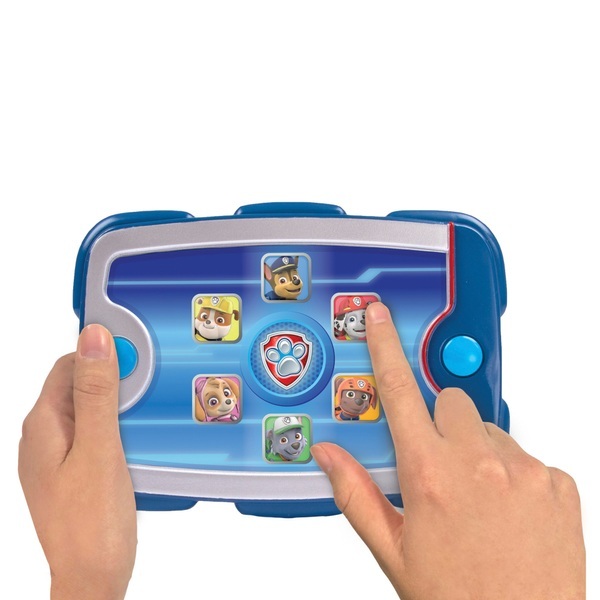 With the Paw Patrol Ryder's Pup Pad you’ll be able to call on the whole Paw Patrol crew when it’s time save the day! From Chase and Marshall to Skye, Rocky, Zuma or Rubble, you can depend on these trusty pups featured in this cool Paw Patrol Ryder’s Pup Pad! Each Paw Patrol character has over 15 unique sounds and phrases recorded straight from the hit TV show for lots of Paw Patrol fun! Just like in the show you can contact the Paw Patrol when an emergency arises. Just press a button to hear a phrase. Whether it’s Chase, Marshall, Skye, Rocky, Zuma or Rubble, teamwork is only a button away! Race to the ruff-ruff rescue with Ryder’s Pup Pad!